Dublin and Galway are two cities I have always wanted to visit. I was looking forward to getting out on the roads and heading across to Galway and the Cliffs of Moher. I was also very aware of Ireland’s reputation of having some of the best pubs in the UK. Needless to say, there was going to be a lot of travelling, drinking of Guinness and Irish whiskey, and of course plenty of sightseeing. After this trip I was guaranteed to need a good one or two days of rest. If you’re planning a trip to Dublin and Galway for a few drinks at various pubs, this itinerary is for you. 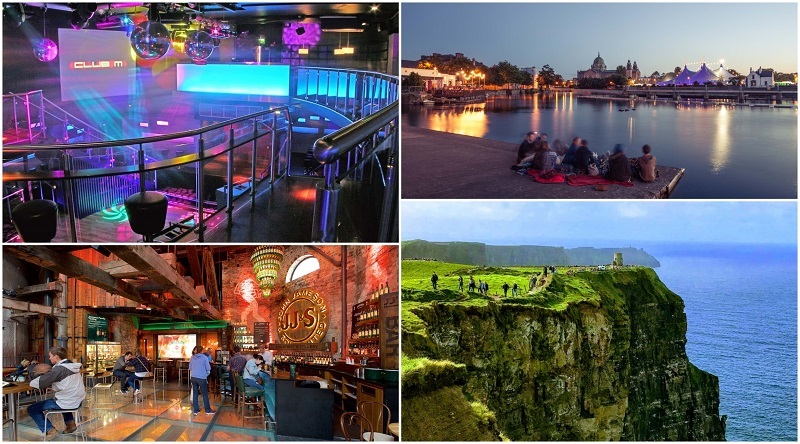 Day 1: Flight into Dublin, National Leprechaun Museum, Harcourt St clubs & bars. Day 2: Old Jameson Distillery, Guinness Storehouse, Jervis Shopping Centre, Temple Bar district. Day 3: Drive to Galway. Day 4: Cliffs of Moher, drive back to Dublin. 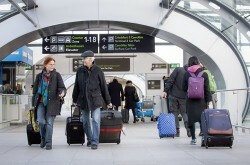 I flew into Dublin Airport from Manchester using one of Europe’s cheapest flight companies: Ryanair. I chose Ryanair because I was travelling on a budget and you will rarely find an air carrier service with cheaper tickets. The airport had a few bus services operating, which were owned by different companies. I was originally enticed to catch the Airport Hopper, because it had a kangaroo on the side. We picked the Airlink bus instead, because it was much cheaper with return tickets costing €10. We bought our tickets at a desk in the airport, but they can also be bought online. The bus ride was very simple and the driver said the name of each stop over the loudspeaker, so we were never confused as to where we were. I had a map with me, so we knew what stop was closest to our hostel. If you want to sort out the airport transfer before arrival, book this private transfer which will provide a door to door service for up to 8 people. 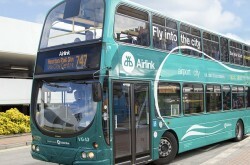 You can catch the airlink express which stops every 10 minutes at terminal 1 and terminal 2. THe bus will take you directly to Dublin city and will stop throughout the city. If you’re going to explore Dublin, make sure you’ve got a map with you. The city isn’t the biggest, but there are a lot of lanes and intersecting streets that do a good job of confusing most travellers. If you’re new to the city and don’t know where to start, try asking the reception staff of the hostel or hotel you’re staying at. They usually know all the popular and lesser-known tourist spots, and have the inside scoop on any current deals or events. They will also know where the nearest public transport is. After checking into our hotel and pub lunch, we walked down the River Liffey and came upon the National Leprechaun Museum. Being the first real attraction I’d seen since arriving, I was quick to say we should go inside and take a look. We purchased tickets for €12 each and made our way through the museum, which felt more like an interactive story than an official display of historical artefacts or information. Despite the museum feeling somewhat like a tourist trap, I did enjoy learning about the origin of leprechauns and how they’ve changed over the years, and hearing the stories of leprechaun sightings and other folklore. The museum also had some rooms with entertaining gimmicks like oversized chairs that were intended to make me feel like a leprechaun. At the end of the museum was the gift shop. The best items I found there were the various books on leprechaun folklore. We didn’t spend much time in there before leaving through the only exit that led us out onto a completely different street to where we entered. 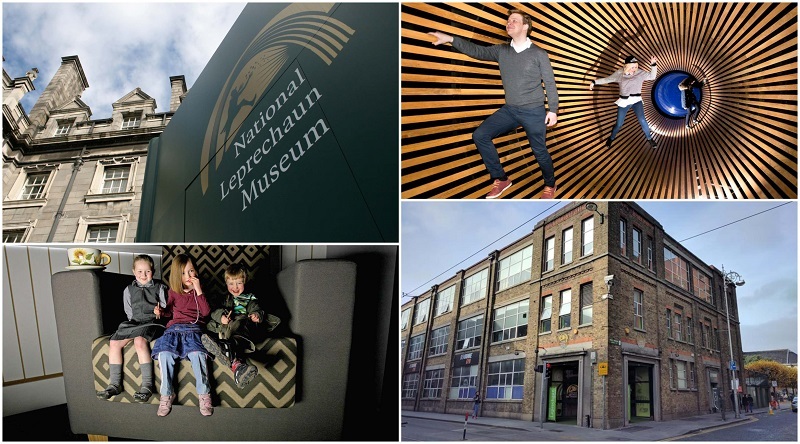 The National Leprechaun Museum wasn’t a bad place to spend 30 to 60 minutes, but it wouldn’t be high on my list compared to the other attractions in Dublin. That night, the excitement of being in a new country pulled us away from the hostel and back onto the streets. Dinner was steak and Guinness at a place called Odeon, located on Harcourt Street. It functioned as a restaurant, bar and club. The meals were delicious, but also pretty small. I didn’t mind because the Guinness filled up what space remained in my stomach. The place was richly furnished and we sat in leather couches while we ate. There was a great chilled-out atmosphere there and I would’ve wanted to stay longer except it was Monday, so Odeon was closing early. Instead we were directed to a place called Copper Face Jacks, located on the same street as Odeon. I thought it was going to be a bar, but it turned out to be a both a bar and club. Stairs led underneath the street to the entrance, which granted access to one of the three levels. The place had a loud dancing area downstairs and a more social-friendly bar upstairs, which meant the place catered to a lot of different types. 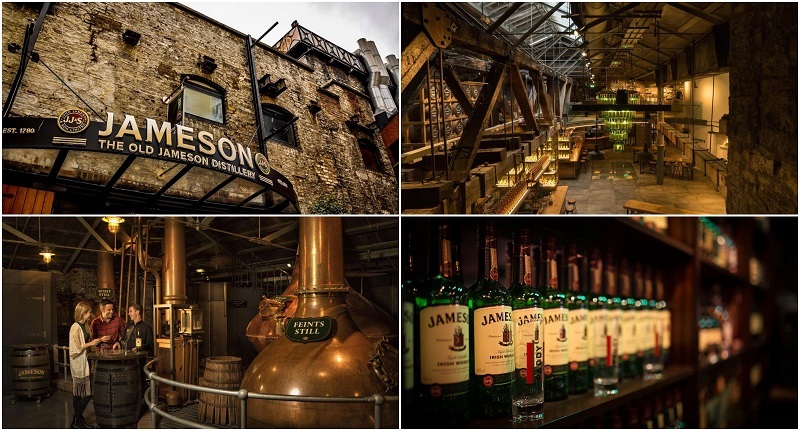 The Old Jameson Distillery was only a few minutes walk from my hostel, so it was the first attraction I saw that day. They don’t make Jameson Whiskey there anymore, but the distillery has been transformed into a guided tour area with restaurants and bars. I only experienced the guided tour. I really enjoyed the actual tour, which I thought provided some engaging and informative moments. It was basically a history of Jameson, from its origins up to the current distilling methods, with a few facts about the whiskey thrown in for good measure. The best part was getting to taste the whiskey at the end of the tour. They served it on the rocks (with ice), neat (no ice) and with a mixer. Each guest was allowed one drink and I chose Jameson’s on the rocks, so I could enjoy its full unadulterated flavour without having to drink it warm. At the beginning of the tour, six guests were picked at random as “official whiskey tasters”. My cousin and I were both picked, and I didn’t exactly know what we’d signed up for until the end. After everyone had picked up a glass of Jameson’s Whiskey to taste, my cousin and I, along with the four other whiskey tasters, were seated at a table in front of everyone else. We each got to taste three shots of whiskey: Johnnie Walker (Scotch whisky), Jameson’s (Irish whiskey), and Jack Daniels (American bourbon whiskey). The guide informed everyone of the differences and after the tasting we had to choose which type we favoured. Despite the guide’s obvious push for us to nominate Jameson’s, I chose Jack Daniels. The whiskey tasting ended the tour and I walked away with a certificate signifying me as an official whiskey taster while also feeling a little tipsy. If you’re not a fan of whiskey, but still want to see the Old Jameson Distillery then you should definitely not put your hand up when the tour guide first asks for volunteers. You might get picked to be a whiskey taster. I noticed some of the whiskey tasters leaving their drinks half full! Such a waste of good whiskey. The Guinness Storehouse was my next stop. It was a little far away, so instead of walking we caught the local bus (number 123) from O’Connell Street. It only cost about €2 for one ticket, which I thought was really cheap. The bus was easy, but finding the entrance to Guinness Storehouse was a little bit harder. I initially thought the big wooden gate with “Guinness” written on it was the entrance, but this turned out to be nothing more than a good photo opportunity. The entrance was a little further down the road with a much smaller sign. Fortunately I’d bought the tickets online, which gave us a discounted price and allowed us to bypass the long queue, mostly made up of tourist groups. The Storehouse was made up of seven levels and each one focused on a different aspect of Guinness like the ingredients, marketing, or history. My favourite areas were the Advertising, Ingredients, Tasting Laboratory, and the Perfect Pint sections. The Ingredients section was the first display I saw. It used a virtual “expert brewer” to present information about the various ingredients used to make Guinness. It was good that I wasn’t forced to watch the video, but I could instead just listen to the expert brewer’s voice while looking around. I was even able to touch, smell and sometimes taste the ingredients! I thought it was really clever how this typically boring subject was presented in an interactive and engaging way. I got to have my first taste of the Storehouse’s fresh Guinness in the Tasting Laboratory. During the tasting session, a Storehouse staff member guided us on the best way to taste Guinness in order to ensure all five senses were utilised. In Advertising I saw all the posters and marketing strategies Guinness has used over the years. There were also displays of the various Guinness bottles, glasses and novelties, dating right back to the company’s first ones. One of the best parts of this section was throwing on a set of headphones and watching the Guinness television adverts from years ago. The Perfect Pint area was easily my favourite part. It was where I was allowed to pour my own pint of Guinness, using the traditional pouring techniques, and drink it afterwards. The Perfect Pint area allowed me to try something I’ve never done in my life (even though I’ve been a bartender) and may never do again. Overall, I really enjoyed the Guinness Storehouse. Some people consider it too commercialised, but I found it to be a really engaging and fun foray into the world of Guinness. Along with my favourite parts, there was a lot more to do. Jervis Shopping Centre was one of the biggest shopping centres in Dublin, so it had pretty much everything I needed in one place. While we had to grab a few essentials at the pharmacy, we still had time to walk off the alcohol and stroll around the shopping centre. A few snacks did the trick to sober up as we prepared for another big night out. 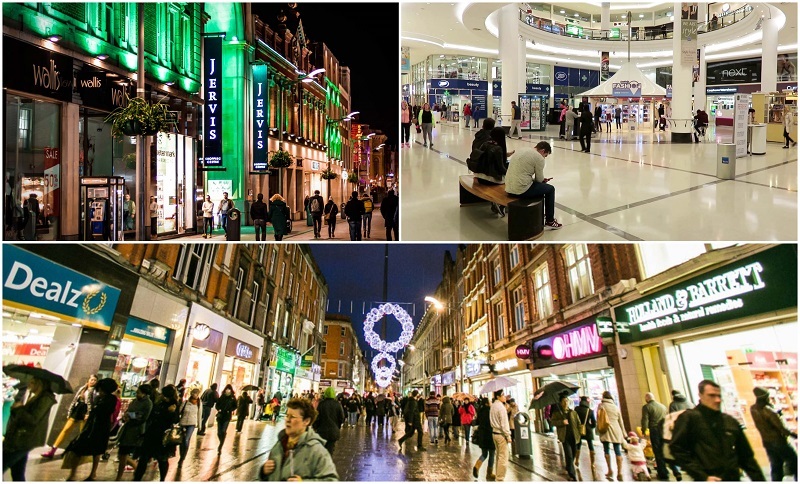 If you’re after some shopping therapy, Jervis Shopping Centre is a good place to stop and relax. 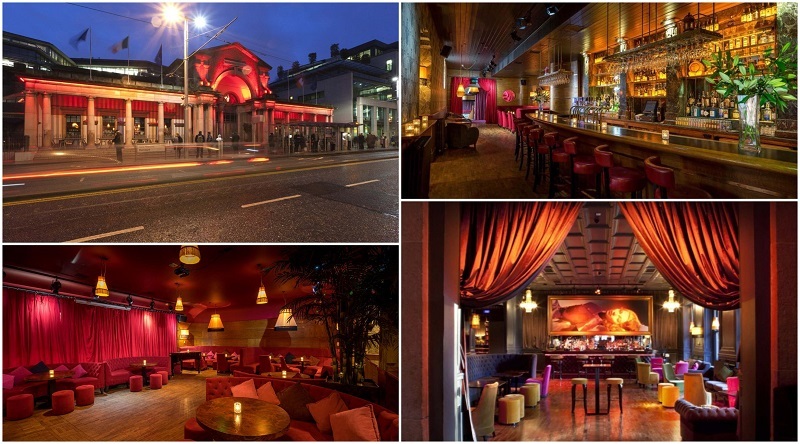 That night I went to Temple Bar; the bar and live music sector of Dublin. Within this area I found an entrancing juxtaposition of old cobblestoned streets and walls with modern pubs and restaurants. There were numerous bars all located close together, with the main attraction being the Temple Bar Pub, easily recognisable by it’s red-walled exterior and the merry sounds of instruments and singing coming from inside. The interior looks hardened by years of rowdy crowds, with decorations that depict the pub’s rich history. I quickly recognised this was the place to come any night of the week for great live music, cheap drinks and a friendly crowd. I found most bars in Dublin had live music until 1 or 2 in the morning and the typical final song was either an Oasis or U2 classic ballad. That night the music had me linked arm-in-arm with complete strangers singing until the band stopped. The Temple Bar district and a lot of Dublin has those very cool and very old cobblestone streets. These aren’t so fun if you’re wearing high heeled shoes and I noticed a lot of women struggling to stay upright; a feat that wasn’t made easier after they’d had a few drinks. You might want to leave the heels in your suitcase when going out to the Temple Bar. My cousin and I caught a taxi to Budget car hire in Dublin, which I’d researched online to see what prices were like. At first we thought it was going to cost about $50 to hire the car for two days, but by the time insurance, the hire fee, and necessary GPS were added, it was closer to $150. Fuel also ended up costing about $100 for the trip, so it ended up being a lot more expensive than expected. That was the price of having a bit more freedom to go our own way. We jumped into the hire car, a four-door Hyundai Accent, excited to venture out across Ireland. We decided to detour off the main highway and take the country roads part of the way. The destination was Galway, but right then I was more excited about what I’d see on the way. If you prefer to relax, consider joining a tour so you don’t have to drive the long hours. 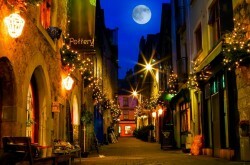 A Galway walking tour is included along with entry to Cliff of Moher. We checked into Kinlay House Hostel late that afternoon, after spending almost five hours on the road. We had a brief rest before walking the streets of Galway admiring the foreign architecture and various statues around the city. Rain arrived and we were forced into a small pub called Monroe’s Tavern. It had an intimate and homely feel with comfortable seats. We positioned ourselves in a booth near one of the stained-glass windows and sipped beer while playing the various board games available. The live music started shortly after we arrived and immediately boosted our spirits. Like Dublin, a lot of Galway’s pubs and clubs were located in one area, scattered around St. Nicholas’s Collegiate Church. When the rain cleared, we hopped from one to the other, finding a similar atmosphere in each one. I discovered that most of the establishments consisted of two levels with the bottom floor acting as a pub with live music and the top floor used as a club with DJs. Despite having a great time, we called it quits early that night knowing a big day out at the Cliffs of Moher awaited us in the morning. We woke up early on the fourth day. It was to be my last day in Ireland as I had a 6am flight the following morning, so I was really keen to get out of the hostel and onto the road. We checked out, paid the overnight parking for the car (about $20) and left Galway, heading straight for the Cliffs of Moher in a small area called County Clare. Parking for the Cliffs cost about 5 euros and I paid another 6 euros for a ticket, which allowed access to the Cliffs Exhibition inside the visitor centre and the actual Cliffs of Moher. This was a very cheap price for such a memorable experience. There are a few viewing points at the Cliffs of Moher that provide slightly different views. It was a partially cloudy day when I visited, but I was still able to see the sheer drop from land to water and the vast ocean. I walked to each viewing point and found both had their merits. There were telescopes I could look through, but these were a little aged and foggy so I preferred not using them. There was also a tower called O’Brien’s Tower, which provided the highest viewing point. It cost €2 to enter, but I didn’t mind paying because I was told the money went towards maintaining and improving the Cliffs of Moher. Honestly I only stayed in the tower for five minutes because it was pretty crowded at the top. Outside, the main attraction were the views, but inside was the Cliffs Exhibition: an assortment of interactive games, media and history. I enjoyed both sides for different reasons. 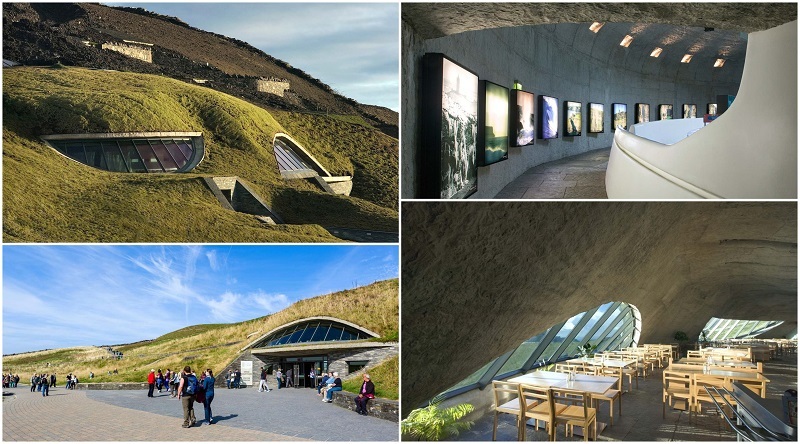 The Cliffs were incredible and made me really appreciate being in a different part of the world, while the exhibition, it fed my desire to learn more about the Cliffs and their history. An onslaught of rain and wind forced me inside earlier than I wanted, so I was thankful to find there was a lot to keep me entertained. I really enjoyed the amount of interactivity available, especially the video games that allowed me to take control of a species from the local sea life and attempt to survive in the ocean. My cousin and I competed to see who could survive the longest as a Shark and Spider Crab. The Cliffs Exhibition also had a couple of movies that are definitely worthwhile seeing, especially the virtual tour, which took me through the Cliffs’ cave systems. After exploring, I had lunch at the cafeteria. It was a little overpriced and in hindsight I should have brought my own food to eat at one of the picnic tables outside. If you just want to see the Cliffs of Moher and nothing else, you can avoid paying any fees by travelling a little further down the Cliffs. You still get excellent views, but you won’t see the Cliffs Experience, Obrien’s Tower or any of the official lookout points. Make sure you pack some bad weather clothing, because a sunny day can quickly turn into heavy rain. Before leaving, I looked through the shops underneath the visitor centre. Most of these were similar to market stalls, selling handmade or very minimally produced goods. My cousin and I went halves on a CD with classic Irish drinking songs. We listened to it on the way back to Dublin and found a few gems we could sing-along with. The trip back to Dublin took half the time because we drove on the highway the entire way. We checked back into our hotel that afternoon and rested a while before heading out for another round of drinks and bar hopping. My last night ended pretty early because of my fast approaching 6am flight. I polished off one final pint of Guinness before heading to bed, my body and mind completely exhausted from a busy four days in Dublin and Galway. Ireland is a vast country with a beautiful countryside and thriving cities. I was fortunate to experience both sides and loved what each one had to offer. Dublin and Galway had some great attractions, culture, live music, hole-in-the-wall bars, and an all-round fun and exciting atmosphere. The countryside had its fair share of memorable wildlife and scenery. 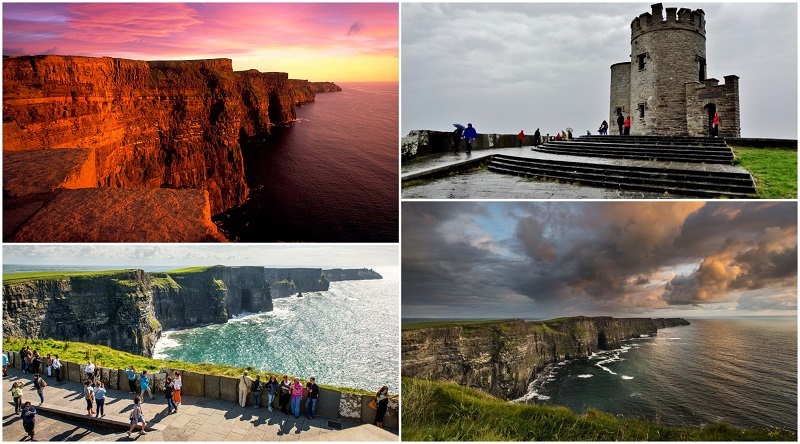 Ireland is definitely a country that needs more than a 4 day itinerary to explore.